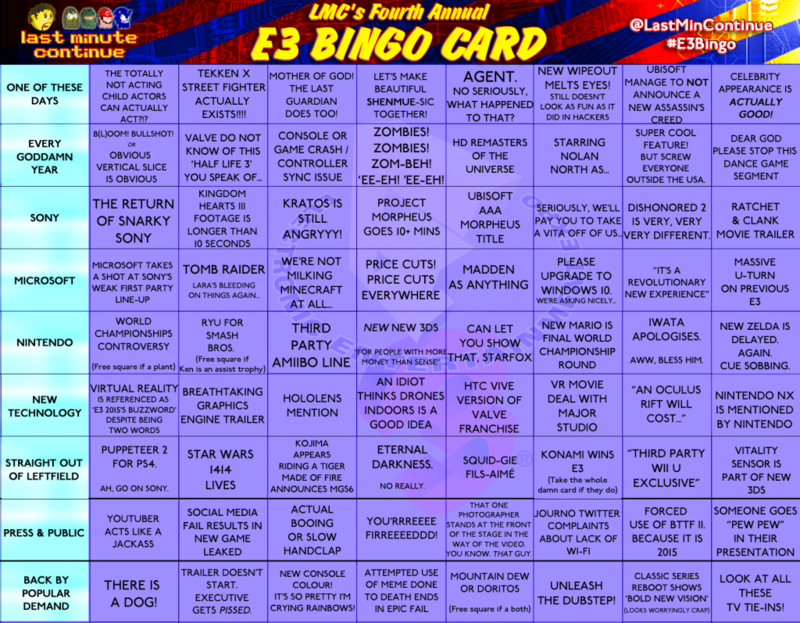 Returning to grace your desktop like a wallpaper you just can’t get rid of because Windows refuses to let you change the settings, lock up your Dreamcasts, hide your Wonderswans, the LMC E3 bingo card is back! A little bit earlier than I was planning, but if I waited any further it seems like the entirety of E3 would have leaked or be spoiled and the Nintendo World Championships are happening at the time I’m writing this so its kind of the right time to put it live. So, welcome to the new look card. It is greatly expanded although there are plenty of familiar squares there for those who have been following it for the last few years. Indeed some of the squares have evolved over time and are now the opposite of what they once were. There are 72 squares spread across nine specific categories – yes, we can all try for lines properly now. Click the card to bring up a bigger version you can download. Every Goddamn Year: Like Old Faithful, these ones you can always rely on. Nintendo: And… well… it’s just Nintendo really. New Technology: E3 2015 is set to be the year of VR, there’s plenty of tech waiting in the wings! Straight Out Of Leftfield: Not a chance in hell. Right? Press & Public: Because E3 isn’t just about the stuff on the stage. Back By Popular Demand: Previous squares that I’d get complaints about if they were left out. – Valve do not know of this ‘Half-Life 3‘ you speak of. – Social Media fail results in new game leaked. – Ryu for Smash Bros.
– Dishonored 2: In fairness we don’t know the answer to that question yet. – Ratchet & Clank Movie Trailer: It MUST be a new trailer for the movie, not the game of the movie. – The Last Gaurdian: Never mind the stories and rumors of people working on it. The ‘pics, or it didn’t happen’ rule is in effect. I want VIDEO PROOF in trailer form. – Journo Twitter Complains About Wi-Fi : We actually got asked about this one by a journalist. E3 must begin for this one. “My hotel’s service is crap” is hardly the fault of E3, is it? Be sure to keep us and others up to date with your progress using the hashtag #E3Bingo and tweeting us at @LastMinContinue. Best of luck – to all of us!